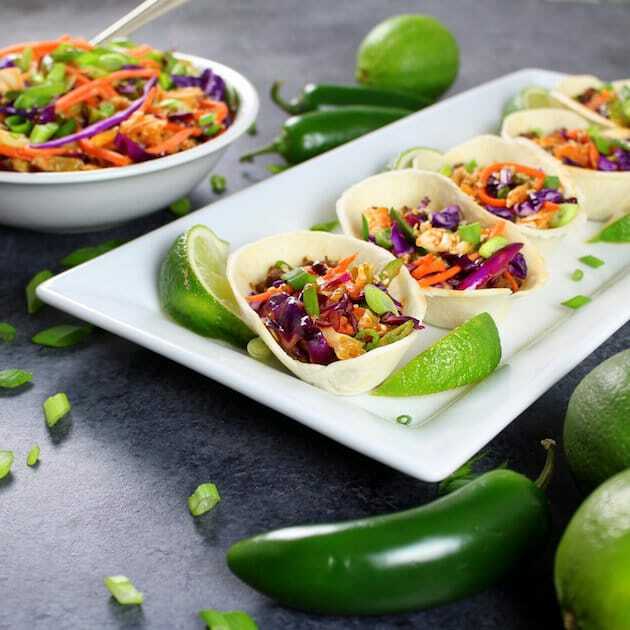 Korean Mini Taco Boats with Spicy Asian Slaw are the perfect game day finger food! 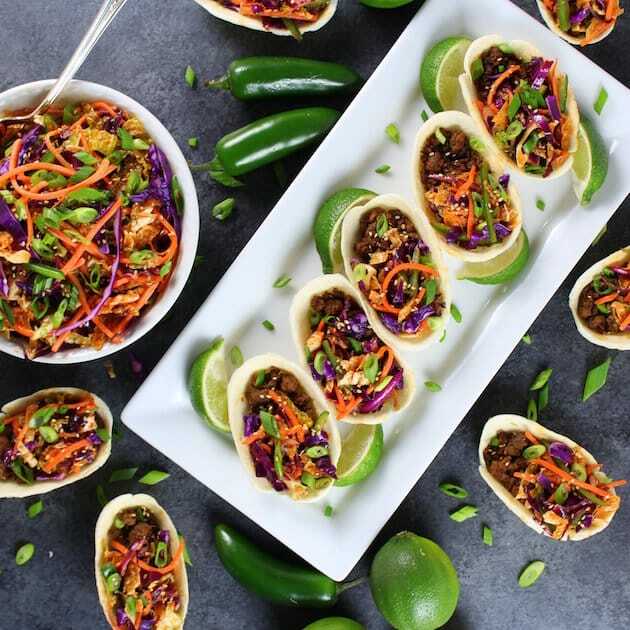 With sautéed onions, fresh ginger, garlic, sesame oil, and ground beef and pork… layered with a spicy Asian slaw, these taco boats will score big points with all your friends. 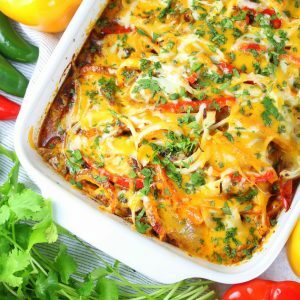 Thanks to our friends at Old El Paso & Walmart for sponsoring this post! All content, images, & opinions are my own! Are you a football fan? 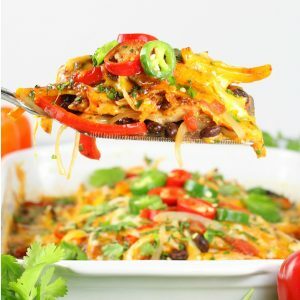 Or maybe you’re more of a football food fan? Then I gotchu covered! Have you been watching the NFL playoffs? We’re not die-hard sport fans, but we do appreciate a good football game. Like the Green Bay Packers vs. the Cowboys Sunday – Whoa. That game was something else! A nail-biter right down to the end. There’s nothing like a competitive football game to provide some good old fashion family entertainment. #whoneedspoldark #ME!! And as much as I appreciate watching a game with my crew, I have to say I like eating all the yummy tailgating grub even more! There’s just something about a tableful of tasty morsels shared with friends and family. I bet you might be able to relate? Mmm mmm! I’ve said this before but just in case you missed it: I’m a huge fan of a big ole’ spread of appetizers or bite-sized finger food. You get to try a bunch of different munchies that are the perfect sample size, with no utensil required! And speaking of bite-sized finger food, that’s what we’re talkin’ about today! Can I get a whoop whoop? 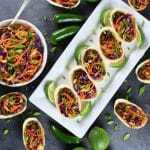 I’ve got the most delicious appetizer recipe to share with you…Korean Mini Taco Boats with Spicy Asian Slaw! 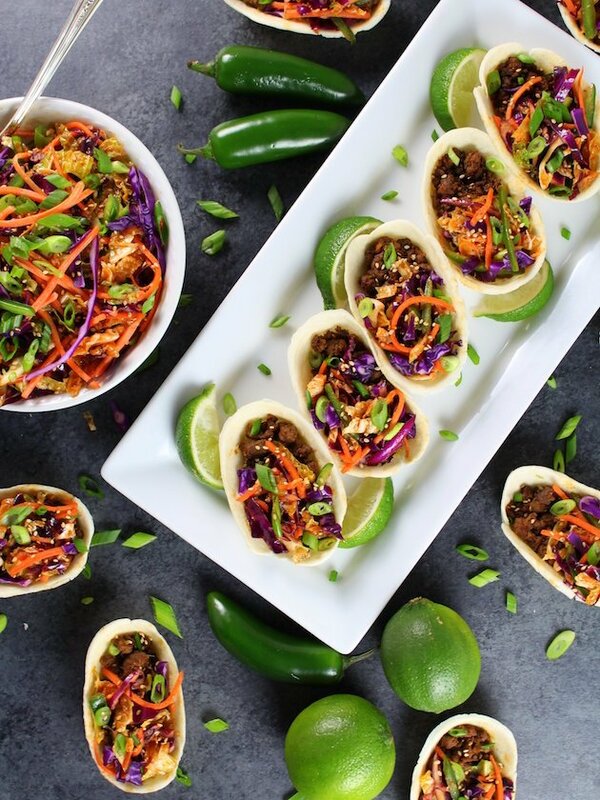 These taco boats are the perfect utensils to scoop up all kinds of goodness. They’re really soft just like a flour tortilla, and they hold the perfect amount of whatever yumminess you want them to. And in this case, that would be some ground beef and pork sautéed with onions, garlic, fresh ginger, Asian chili sauce, sesame oil and spices. 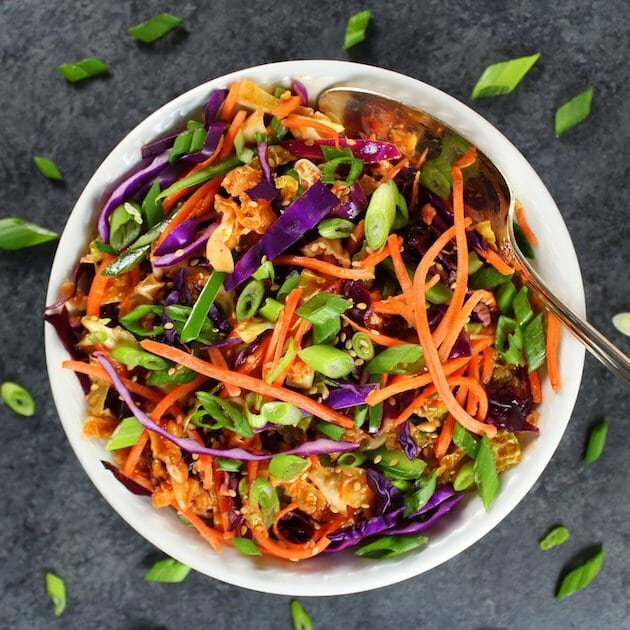 Then topped off with some crunchy spicy Asian slaw and toasted sesame seeds. Yum – definitely a touchdown in the flavor department. 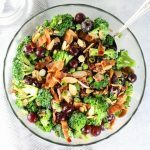 The combo of all this goodness is out of this world delicious, and the different textures make this one fabulous game day app. 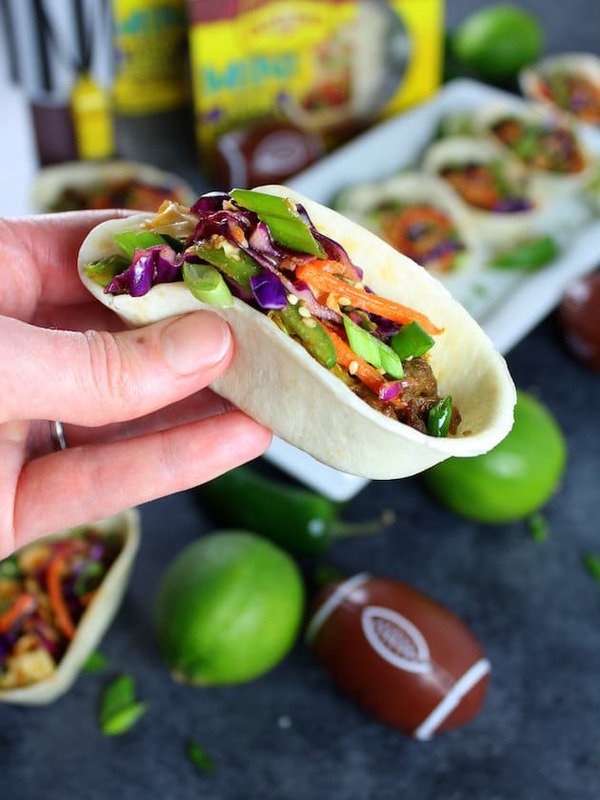 If you’re like me and love some bite-sized football food, then these Korean Mini Taco Boats with Spicy Asian Slaw are the perfect munchies for the Big Game! 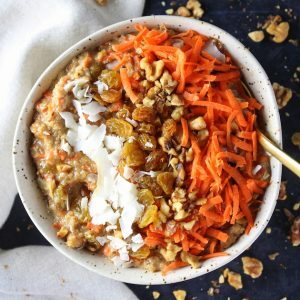 You’re gonna’ want to go the distance and make a double batch – trust me you’ll be glad you did! 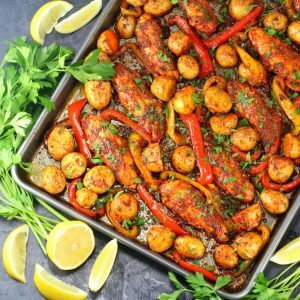 I’m not a huge football fan, but I AM a huge football FOOD fan, and these sound sooooo amazing! I’m loving the video you made, too — I’m sitting here watching the ingredients go into the pan like “ooh, soy sauce, yum. Oh, Gochujang! YUM! Oooh, brown sugar, yum!” hahaha! And what a fantastic use of the old el paso boats. I gotta say when I saw those advertised on TV I was like “huh?” but now they make perfect sense. Now I wish I were going to a superbowl party just so I could make these (and have people to share them with so I wouldn’t eat them all)! Hi Willow! 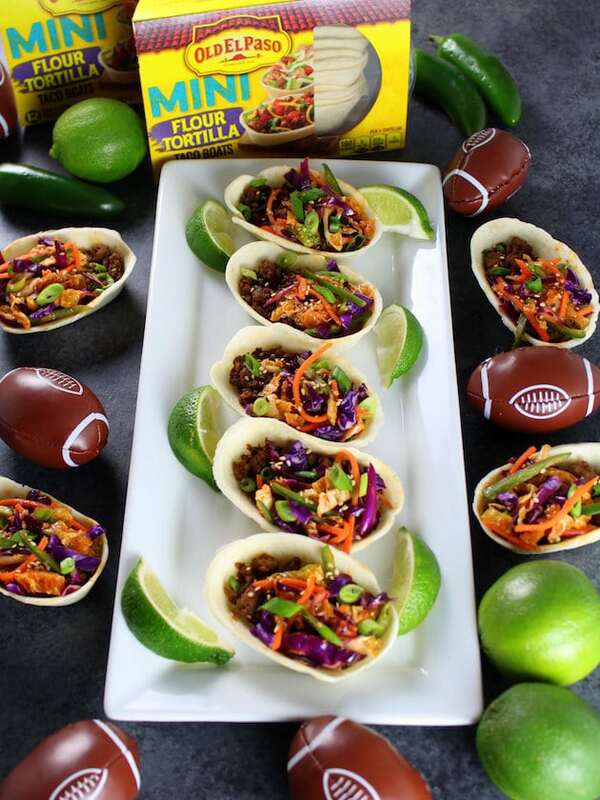 I would be in the same “taco boat” as you (sorry couldn’t help myself😆) – I’m definitely a football FOOD fan too! I’m also a big fan of Mexican and Asian food and these boats seemed like the perfect way to fuse the two together. The recipe does makes quite a few boats so we just called it dinner. I figured it was a pretty balanced meal with protein, veggies, and grains. Thanks so much for your nice compliments! Have a great week! Thanks so much, Revathi! I’m all about eating food that looks beautiful. You know what they say…you eat with your eyes first.😃 The taco boats are new to Old El Paso’s product line. They offer both regular sized boats and mini boats that are available next to all the other OEP products at the grocery store. Take care! I’ve not seen the mini taco boats at the grocery store but the little guys look and sound amazing. I like the idea of your amazing Korean flavors filling the taco!!! Hi Dan! Thanks for your kind words and the 5 star rating!! Woohoo!! The taco boats are new to Old El Paso’s product line. They actually offer regular sized boats and mini boats both available next to all the other OEP products at the grocery store. I’m a Mexican food lover for sure but I also love Asian flavors. 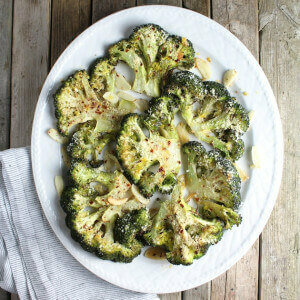 I couldn’t help but fuse the two together in this recipe – just so delicious! 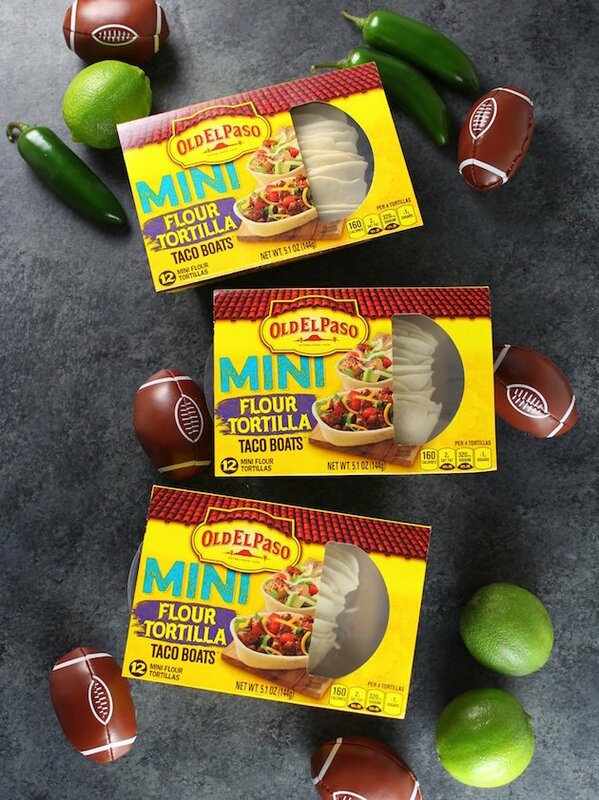 These mini taco shells are so cool and the perfect size to fill! 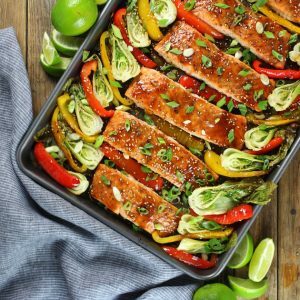 This recipe looks so packed full of flavor too! Thanks so much Bintu! Aren’t they just adorable?? 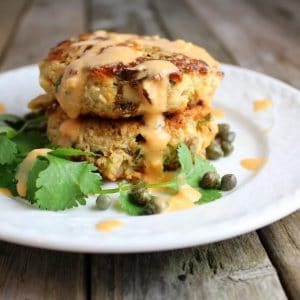 The flavor and texture combo of these is OOTW delicious!! As I’m typing this my mouth is watering. I guess it’s time to make another batch! Thanks again! I am more like a football food fan, ha ha! 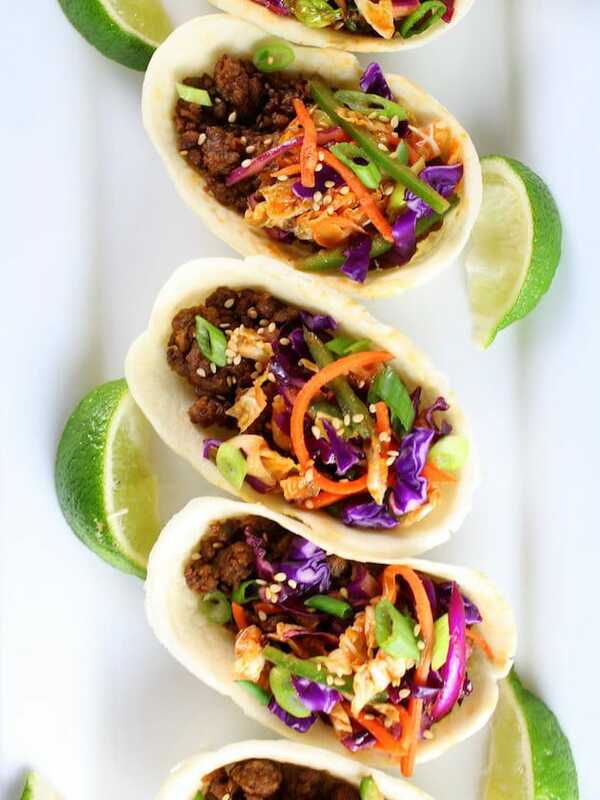 I love Gochujang so these cute tacos are right up my alley. 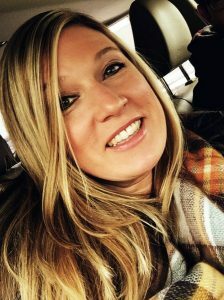 Sharing them on social media! That’s perfect Igor – “football food fan” should have totally been an option! 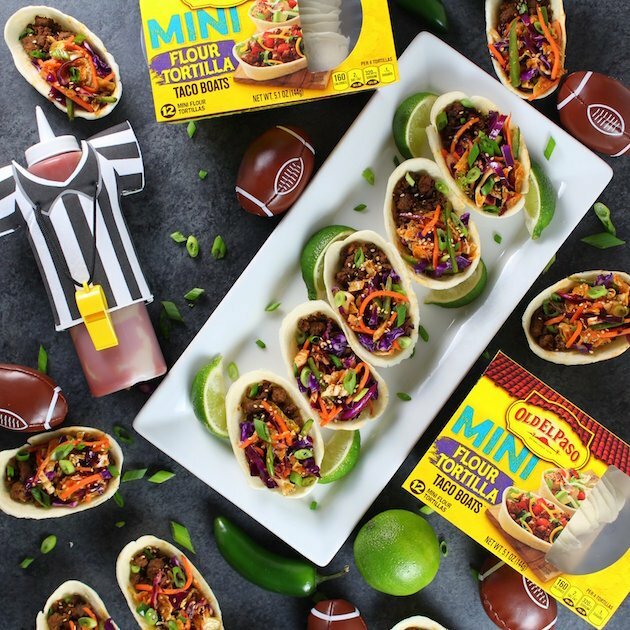 These mini taco boats are almost too cute to eat – almost! 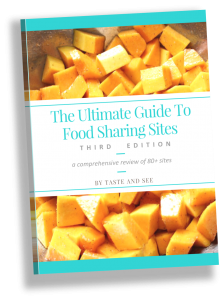 Thanks so much for sharing the recipe – I’m super grateful!